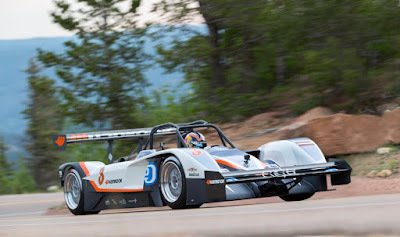 The Drive e0 PP03 one megawatt AWD battery electric racer driven by Kiwi Rhys Millen has become the first electric vehicle to qualify P1 overall at the 93rd running of the Pikes Peak International Hill Climb. The 2015 event could go in history as the first outright win by a battery electric race car. With Mitsubishi's EV works team, who funished 2nd and 3rd outright in 2014, absent for this years race, the competition is between two Megawatt class EV teams. 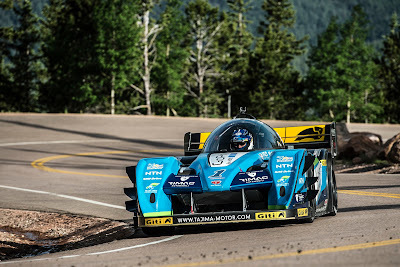 Multiple champion Nobuhiro Tajima has teamed up with Rimac Automobili to build a 1.1 MW AWD racer while Rhys Millen drives for Latvian team Drive e0 with their 1 MW AWD special. Racing starts @ 8 AM MDT (Mountain Daylight Time - GMT -6 Hrs) Sunday 28th June.